Since I am the Queen of the After Season Sales, I have these cute Halloween sill sitters purchased last November. I pick up these things after the holidays (75% off!) and store them for the next season. Yes, I know, I do have more storage than the average person. I just cannot resist a bargain, LOL!! Things like these made wonderful gifts for the office staff, little inexpensive ways to say thank you for the hard work. But, now that I’ve been laid off, I had to come up with another idea for using these (and I have to stop succumbing to temptation after every holiday). Part of my problem is I truly do enjoy giving little gifts to friends and co-workers. We do have four neighbors on our mountain road, and none of us has seen any trick-or-treaters in many years. No one wants to walk our road, LOL!! So I thought I’d become the Great Pumpkin this year for the neighborhood. You know, the Great Pumpkin rises out of the pumpkin patch at Halloween to bring gifts to good little girls and boys, or so Linus thinks. 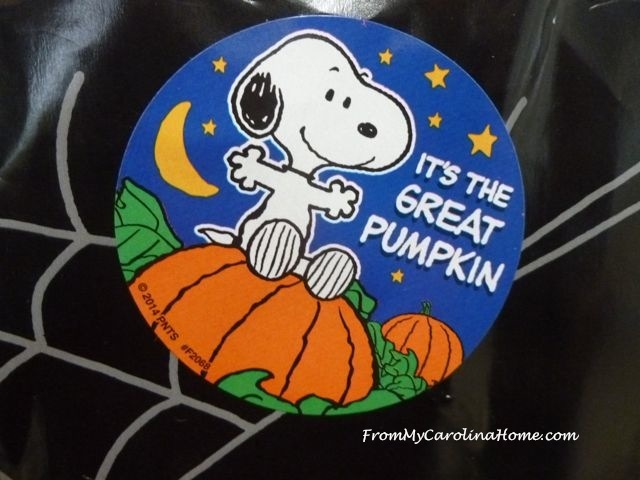 I ordered some Great Pumpkin stickers online, and dug out some Halloween gift bags I had saved. Of course, that meant I needed to do some baking. Pumpkin Orange Bread was perfect in little mini loaves. I packaged them in little candy corn bags, sealed with pumpkin stickers. I didn’t put any cards in these, since the Great Pumpkin brought them. I delivered them to the neighbors, having a little bit of a visit with each one. My original intent was to hang them on doorknobs and leave them for the neighbors to find. But, with the wildlife around here, that wouldn’t be the best idea. But, if there wasn’t any food in them, they could be delivered anonymously. It was good to see everyone, especially the older couple at the other end of the road. The mister of the couple had a stroke last year, and his recovery has been slow going. The missus doesn’t get out much anymore, they are both in their late 80s. I need to go see them more often. I need to get her to teach me how to do more knitting stitches than just knit and purl. She also does lovely crochet, and I could re-learn that too. I’ll get out the It’s The Great Pumpkin Charlie Brown video this week, the holidays officially start for me when I get to see that show. Of course I have it on DVD. Hard to believe that it was originally on TV in 1966 – this year is the 50th anniversary of that show. 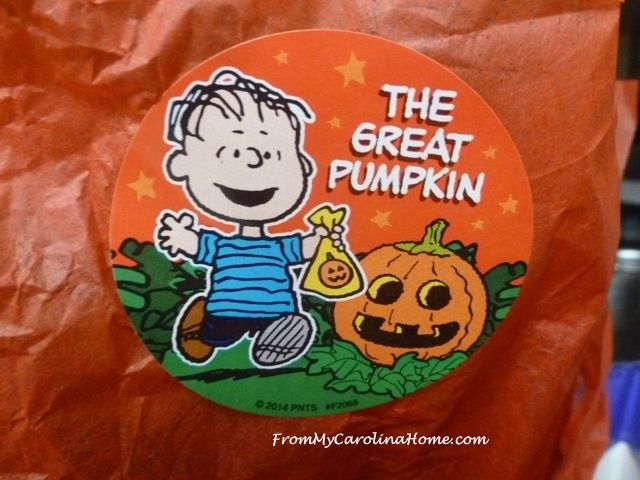 Could you become the Great Pumpkin for someone this year? PS – If you are a quilter or stamper, check out my Autumn Jubilee giveaway posts from earlier in October! 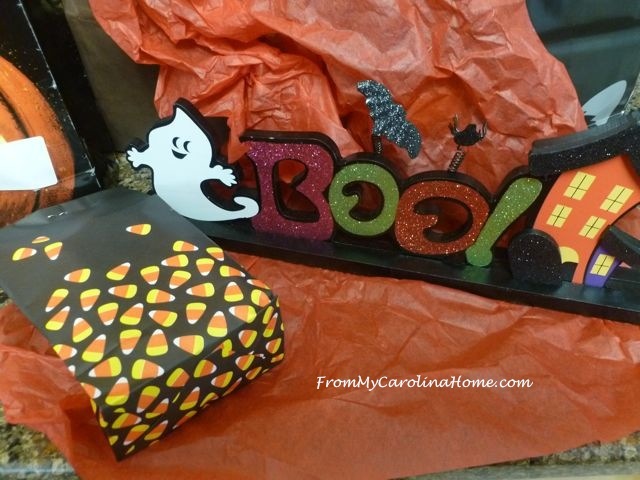 All giveaways can be entered until Halloween so you still have time. More giveaways coming up Friday and next week as Autumn Jubilee continues to the end of October. I am really impressed with this post Carole. Such a simple way to meet ones neighbors. I am new to this neighborhood and this is a great way for me to meet and greet without any hassle. I love your interest in the older couple and I really hope you do go see them soon. Asking a senior for help is what keeps us happy and involved with life. It would really mean a lot to her…Blessings to you…. Lol Carole, you & I have a lot in common when it comes to the after season sales! I sometimes luck up and find things 90 percent off! The pumpkin loaves look yummy! I love pumpkin & it’s Sooo good for you! 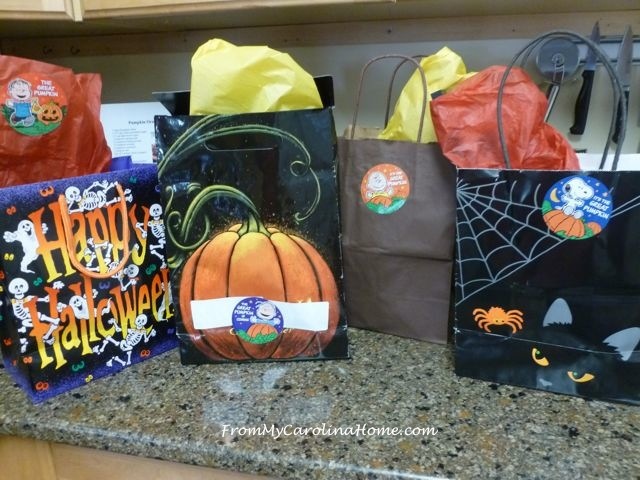 Such thoughtful gifts and what a nice surprise for your neighbors! I so love the after season sales!!!! My daughter used to call me the CLEARANCE RACK QUEEN 🙂 She was 12 when she started it and it was not meant as a compliment at all and I think she was disappointed that I took it as one. LOL! I’m sure the older couple loved the bread. I printed a copy, but did not have an orange. Will get one. Thanks. You have some lucky neighbors! What a great idea of how to give a gift, and not just a little gift, you also made home made bread and I am sure that is so appreciated. Very lovely packaging! What a wonderful idea! When we first moved here I went around and introduced myself, but got very little response. The new people next door didn’t respond really and certainly didn’t reciprocate when I brought over store bought bakery goods, but at least we know each other’s names now. The man did come to our last little BBQ with their little boy, so perhaps after two years they are warming up! You have inspired me to make new outreach to them and to the other neighbors too. Thanks for the inspiration! Yesterday I did lots of baking, most of it will be posted today to Grandson at University about 2 hours from our home. He so enjoys the biscuits, slices, some very nutritious, others yummy like fudge!! 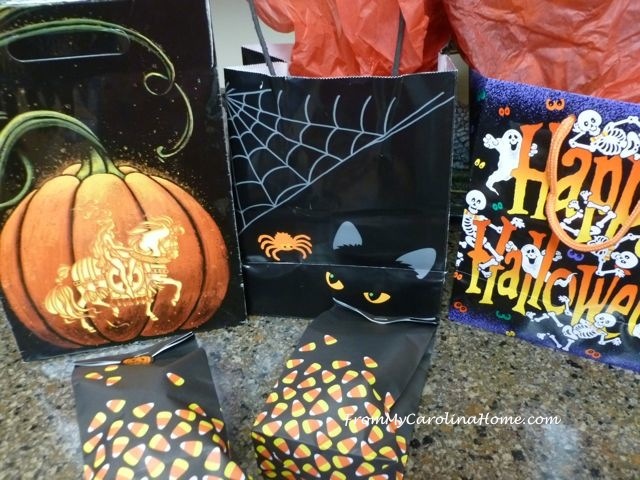 Bags with goodies, a wonderful heart-warming idea, and great way to be able to visit and see if the neighbours are OK. Do the old couple have any home help? Family who visit? A loaf, home baked ,is a gift to treasure. I missed hearing that you are not working now. I marveled at all the extra things you did while you were on the job, and I still wonder how you get so many things done. You are a good neighbor! 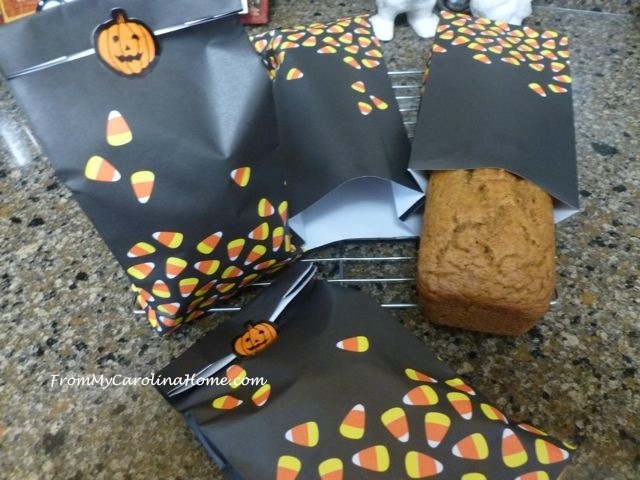 I will do the Great Pumpkin thing with my grands this weekend, bake up some of the pumpkin orange bread (bought pumpkin, brown sugar and orange today) along with the Autumn Jubilee table runner that I will quilt tomorrow. I don’t bake anymore for myself, as I have no restraint! Living in an apartment complex with mostly younger working people, hellos in the corridors are about it. Looking forward to buying a condo in a senior community next year, where meeting people and forming a community will be possible. I’ve decided that it is so important now that I am alone. How thoughtful you are, Carole. I’m sure your neighbours were delighted to see you. I’m a fan of Snoopy too. How fun! What a great way to share the season. You are just too cute – what a fabulous idea!!!! I love all the Peanuts holiday movies, sigh – it seems just a few days ago when my kids were small and looking forward to all those movies every year!! Great idea .I love pumpkin cake! 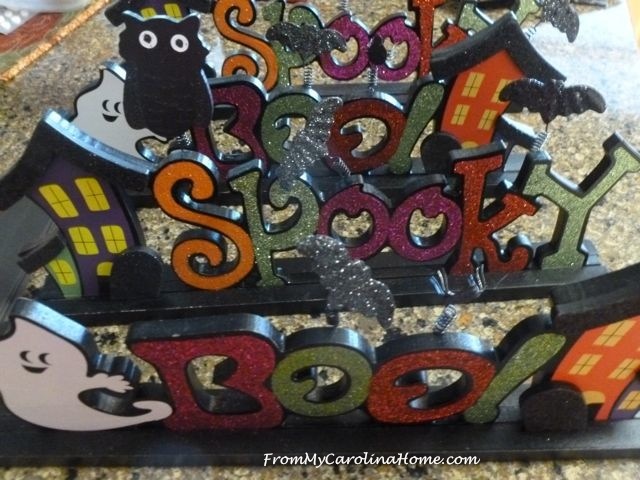 What a cute and sweet idea Carole! Bless your heart for getting out and interacting with your neighbors, especially the octogenarians. Do learn as much from them as possible. Lord only knows what is tucked up in their grey-matter! 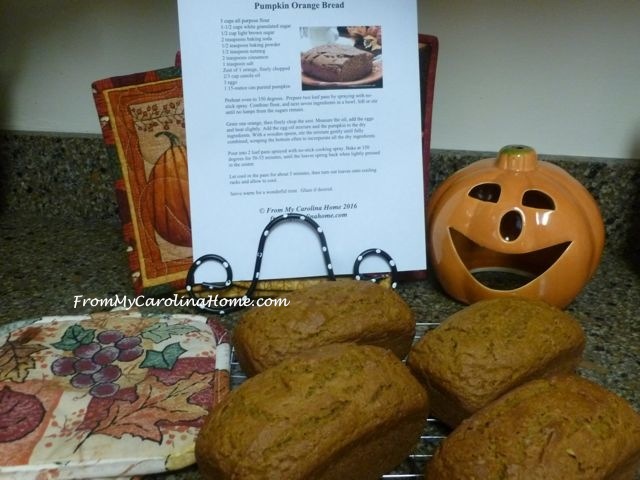 Do you have the recipe for the Pumpkin-Orange bread on your site? I’ll have to dig around and see. Richard in Charlotte, North Carolina. Definitely want to live on your block. LOL What a sweet gesture for you to make. You have a very kind heart. it can’t be 60 years. where did the time go. I do Christmas cookies ( on holiday plates from thrift shop ) for neighbors. tried a cookie exchange one year but most folks were too busy. thank you for recipes , always fun to try a new one. we expect about 100 ghosts and goblins Monday night. Such a thoughtful idea–wish you were my neighbor 😉 Thanks for sharing @Vintage Charm!